Editor’s note: This is the final part of a three-part story highlighting Tufts athletic teams’ contributions to their community. Part 1 was published Nov. 19 and Part 2 was published Nov. 28. After the devastating effects of Hurricanes Maria and Irma in August and September 2017, the Tufts swimming and diving teams hosted a swimathon to fundraise for relief efforts after visiting Puerto Rico for winter training the past 12 years. The Jumbos teamed up with Direct Relief, a nonprofit humanitarian group. Though winter training includes some of the swimmers’ most grueling college workouts, the trip to Puerto Rico and accompanying camaraderie make it worth it. Jessica Fan, a senior on the team, reminisced on the morning all-you-can-eat buffet after a practice that started before dawn, the beach volleyball games in between practices and teammates cooking pizza with a tortilla crust at night. After Puerto Rico and its people were devastated by hurricanes, the team felt a responsibility to help the cause. Last year, the team raised over $10,000 to help relief efforts for Puerto Rico and its neighboring Caribbean islands. A year on and Puerto Rico still feels the catastrophic effects of the hurricanes; many communities and homes still lack basic amenities, such as electricity and clean water, according to the Associated Press. The teams decided to run another swimathon, this time in partnership with Taller Salud, a women’s nonprofit humanitarian group. Fan worked closely with the SAAC to ensure all of Tufts’ varsity teams got the word. Madeline Lee, a senior, said that the team played the most integral role in the organized effort. “Even though [the] SAAC and the whole Athletics department have played their part, the swimming and diving team is the one that’s on deck, timing it, promoting it and volunteering our own time,” Lee said. The teams have raised $18,136 as of Nov. 26. Their initial goal was to raise $15,000. Fan said that every varsity team participated in the swimathon, and that only $4,000 was raised by the swimming and diving teams. “[The event] really did start with a couple of teammates that said ‘Hey, this is something really important happening in the world and something that feels connected to our team, so let’s bring some awareness to it,’” Lee said. Lee added that the event emphasized the privilege of Tufts’ student-athletes. Since Hamilton Pool only has six 25-yard lanes, a traditional swimathon was not feasible. So the swimming team decided to put other teams into groups with 20-minute slots of swimming, with each swimmer trying to record as many laps as possible. The teams appreciated the opportunity to swim without competing, Fan said. 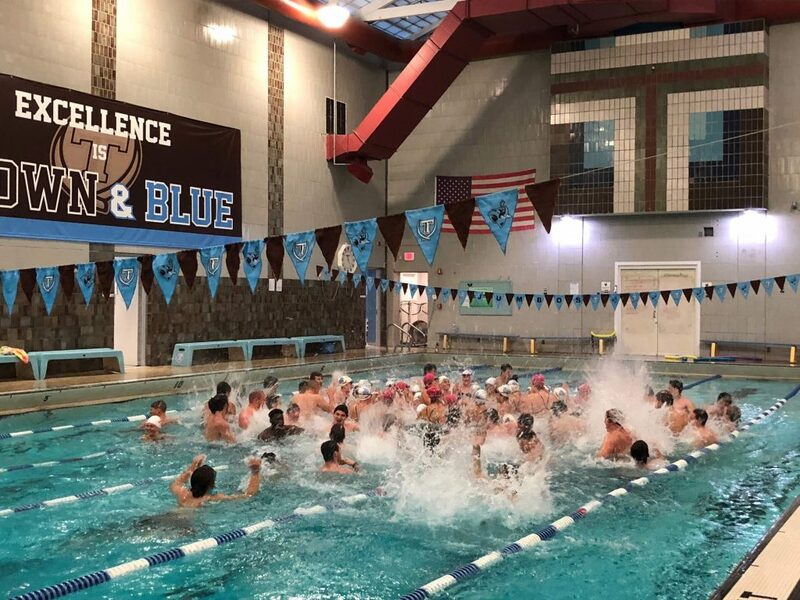 After posting 747 laps last year, Tufts athletes swam 1,470 this year. Fan was taken aback by their success.